Looking for the best craft burger in town? Look no farther than the Burger Bus in Ball Ground, Georgia. This local eatery is definitely on the list of top restaurants in Ball Ground. This unique restaurant lets you eat at tables that are built into an old fashioned trolleybus, or “trackless trolley” as it used to be called. The Burger Bus menu is straightforward, consisting of custom made burgers and hotdogs, along with classic sides and a kids menu. Each burger and dog has its own creative name, with specials like “Lone Star,” “Fried Green Jacket,” “Dogwood Dog,” and “Dad’s on Death Row.” The “Doc’s Guac” burger is also a favorite, featuring a fresh ground angus beef burger patty, cheddar cheese, guacamole, lettuce, jalapeno, and chipotle mayo. To complete your meal, why not try the fried green tomatoes, chili cheese tots, or classic onion rings or fries. And don’t forget your sweet tea! 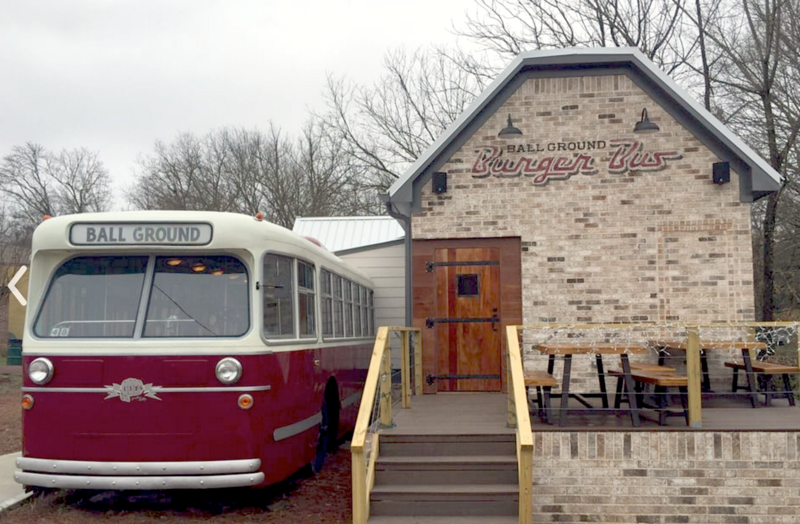 The Burger Bus is located in downtown Ball Ground at 288 Gilmer Ferry Road.